One evening, Very depressed, very sad, almost lost on a battle, all I wanted to do was get some good movie and put myself into some reel life to escape reality. 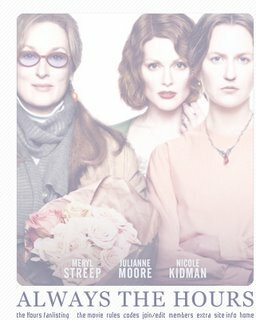 VCD of the movie "The Hours" caught my eyes first at the CD store. All I knew at that point about the movie was "Nicole Kidman" had won Oscars for her role in it. So it definitely was my first choice. I came home, played the movie. The movie opens with the suicide of VW in 1941 after she writes a note to her husband. Then it unravels one day from life of three women from different times; unknown to each other, yet connected through a novel- Mrs. Dalloway. VW (Nicole Kidman) from the year 1925, England has just begun writing her novel "Mrs. Dalloway". Laura Brown (Julianne Moore) from year 1952, LA reading the book, Mrs. Dalloway. Clarissa (Meryl Streep) from year 2001, NYC, leaving a life similar to Mrs. Dalloway. So there begins a story of 3 women in one single day, all three so different from each other, yet connected in a mysterious way. VW- Struggling to fight her insanity in this so called sane world which is no less than custody. Laura- Is married with a kid and pregnant with another who wonders is this all she wants from her life? She feels lost in midst this so called perfect world of being a wife and mother. Clarrisa- So much like Mrs. Dalloway hides her sadness beneath a blanket of smile. Throws party to celebrate and enjoy the moment, yet submerged with immense dissatisfaction bothering her this day. So what does this movie end with? A note that one can take back, to love life for what it is, to live it in a way you want and to respect life to the fullest and then finally put it away. It tells you to live the hours, the moments, right there, right then. It tells you to follow your dreams and make the best decision in life which can vary at times based on the circumstances. Even today, when I am sad, when I am gloomy, I love to watch some selected movies. I think till date the most watched movie of mine during such lonely, sad times has been "The Hours" and following close is "Page 3". Page 3 again fills me with strength to accept reality and move on with life loving it for what it is. MMmmmm... Your synopsis of the movie made me interested: "It tells you to live the hours, the moments, right there, right then. It tells you to follow your dreams and make the best decision in life which can vary at times based on the circumstances." Yes, it is... You may want to ignore some not so common emotions in this film. Of course you will know what I am talking about when you see it for yourselves. But the story, the concept is very refreshing. Sad to hear about your issues, hope everything turns out well. Guess you need to write down your thoughts in the blog or somewhere, it helps me a lot.